This story is about the benefits of a whole horse approach to health. It took a combined team of Owner, Vet, EP and Physiotherapist to bring about the changes. Spring 2016 – On/off mild shortening of stride (footiness). April 2016 – Started Headshaking. May 2016 – Lame Right fore. Nerve blocked to the foot. 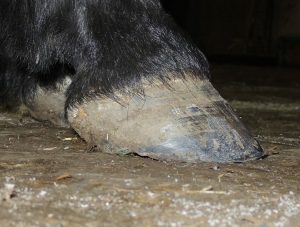 Steroid injections and remedial shoeing recommended and tried but no improvement seen. June 2016 – MRI diagnosed navicular bursitis and possible tearing to DDFT in the navicular bursa area, plus inflammation of the impar ligament. Head shaking was concurrently addressed with PENS treatment and supplementary Magnesium in the diet, but neither completely resolved the problem. Sept 2016 – IRAP treatment started for DDFT and navicular region issues. No improvement seen after treatment. October 2016 – Shoes pulled and 6 months field rest advised by Vet. The first visit by an EP was in November 2016, after the shoes had been pulled by the owner’s farrier. 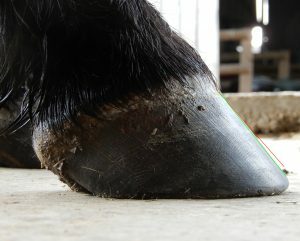 On the initial visit the horse was short striding and landing toe first in walk with a mild lameness in trot on concrete that was less obvious on the arena surface. His toes were run forward and heels under run with weak soft tissues in the palmar (back of the) foot. 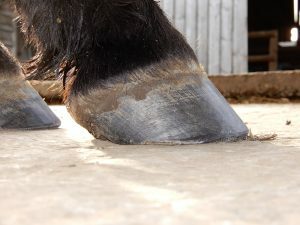 During the initial trim, it was noted that the horse found it very difficult to protract (lift) his right fore to place it on the hoof stand for wall dressing. A recommendation was made to include a registered equine physiotherapist in the treatment plan and begin hand walking on a soft surface over poles 3x per week, to start to encourage a longer stride length. 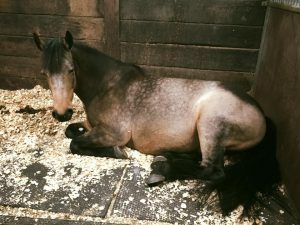 Mid January 2017 the horse was confirmed sound at trot by his vet and after a weight loss program at a local equine swimming facility, ridden work was gradually reintroduced. During 2017 the horse continued with gentle ridden work, but was always a little short striding at trot on concrete, and showed signs of oedema in his legs and body. Sometimes he landed flat, sometimes toe first. He was also still intermittently headshaking. In October 2017 the owner followed the EP’s advice to investigate with Vet reasons for the oedema but nothing diagnostic was found. By Spring 2018, the horse had gained a lot of weight because he wasn’t in full work, had a laminitis attack and went on another weightloss programme but resumed light schooling and hacking by the summer. When he was comfortable and not headshaking he did well at BD Prelim and had started jumping work again. During Autumn 2018 a number of unusual spasmodic colics were seen but no cause could be found. Vet advised adding a gut supplement and no more episodes were noted. Spring 2019. 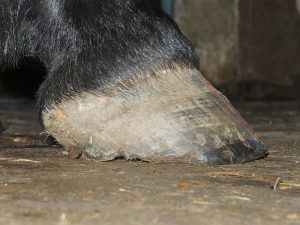 The hoof wall is more upright, the heels are providing better support and the hoof horn looks healthier. 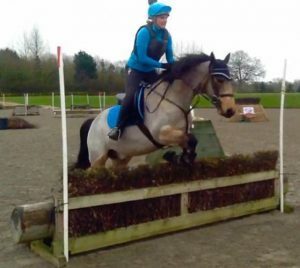 The horse has been out competing regularly and recently won 1st place at BE 80cm Eventers’ Training, can trot out sound on concrete and no longer has any obvious oedema on his body or legs. He is regularly competing at BD Novice dressage and frequently in the top placings, having started to develop a nice medium trot. He now only headshakes occasionally when it is very windy.